Some people like their coffee black; strong, dark, and bitter. Others like their coffee with cream and sugar; sweet and easy to drink. The Young Elites is the equivalent of black coffee. Some people will love it and others, like me, prefer their coffee and YA books with a little bit of cream and sugar. Adelina Amouteru lives in a world torn apart by a virus. The fever left many dead and some of the children who survived were marked by deformities. These children are called malfettos and are regarded as less. Some malfetto’s have even been known to have powers, these malfetto’s are The Young Elites. 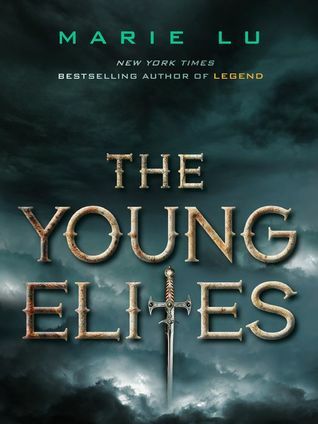 I really enjoyed the premise and world building of The Young Elites. Lu excels at transporting readers to a completely different world and building an eerie society brick by brick. It was the characters not the society that crippled my enjoyment of The Young Elites. Adelina is a very dark character. The novel begins with the death of her abusive father and ends in a similar fashion. Everything in the world-building is tainted by her darkness and this would have been alright had I felt any compassion for Adelina, but I didn’t. Yes, her life before joining the elites was sad but I didn’t see it as a justification for violence or all the lying she did. As I read about Adelina I felt like I was watching the rise of a villain and I wished some hero would defeat her. Despite Adelina I did like many of the other characters especially Raffaele, who was my favorite character. He attempted to balance out Adelina’s darkness. I also liked Enzo, the leader of the elites, and the budding relationship between him and Adelina. I had hopes that this would push Adelina out of her shell but it didn’t. Overall, The Young Elites will not be everyone’s cup of coffee. There were aspects I liked but Adelina really hampered my enjoyment of the story. Despite this I will be continuing the series because I just have to know what happens! I enjoyed this one but you are 100% right that it is like black coffee. I'll be reading the next one for sure too. Great review!